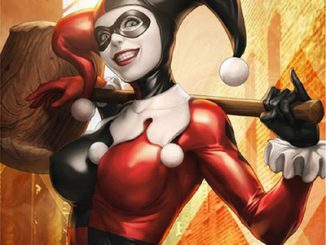 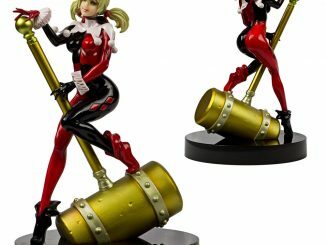 You might think you’ve seen the DC Comics Gotham City Garage Harley Quinn Deluxe Edition Statue but take a closer look because this isn’t what you saw before. 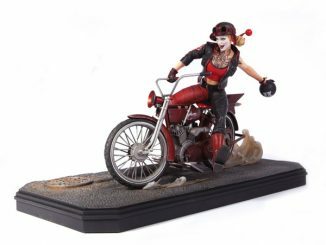 Harley Quinn looking tough on a motorcycle. 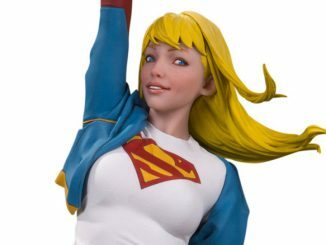 You think you’ve seen this highly-detailed statue before… and you’re almost right. 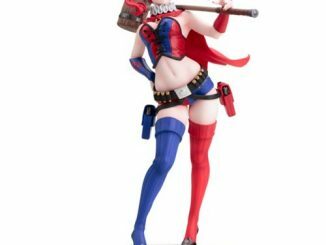 You’re thinking of the regular DC Comics Gotham City Garage Harley Quinn Statue, but this is the deluxe edition, which gives Harley a little company. 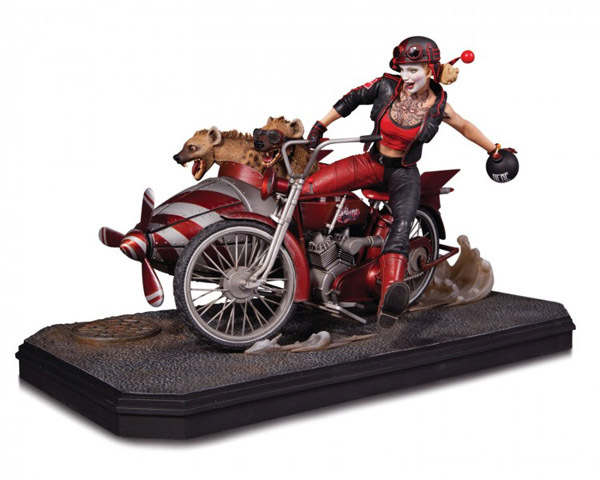 Just like the other statue, this one features a tattooed Harley Quinn getting ready to toss a bomb from her awesome ride, but this deluxe version of the statue adds in a red and silver striped sidecar, complete with propellor… because why not? 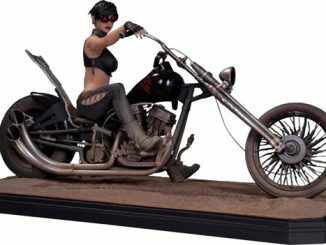 Of course, a sidecar is just added weight unless you have passengers, so two fun-loving hyenas have joined Harley on her spree of destruction. 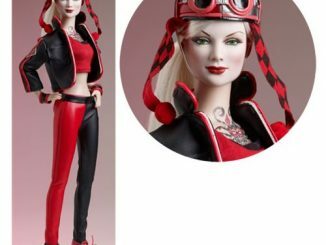 One of them even wears goggles. 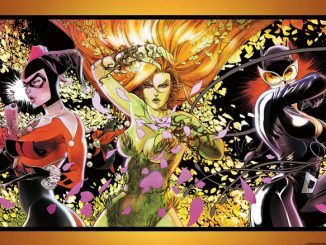 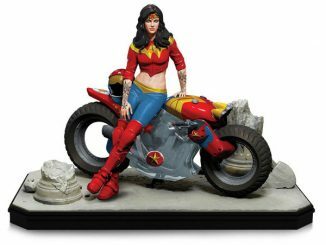 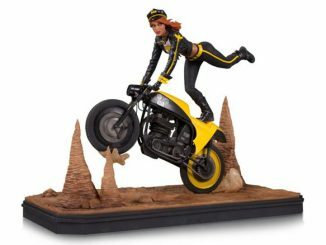 Measuring approximately 15-inches long x 8 1/2-inches tall x 7 1/2-inches wide, this latest addition to the Gotham City Garage series was designed by Dustin Nguyen, and sculpted by Adam Ross and James Marsano. 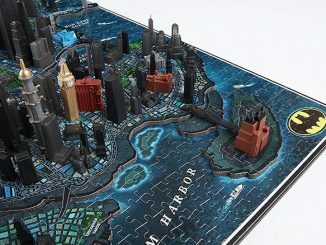 It’s limited to 1,000 individually numbered pieces. 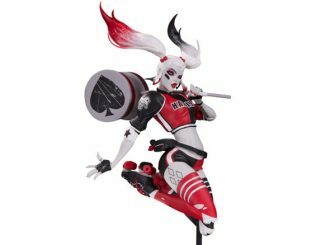 The DC Comics Gotham City Garage Harley Quinn Deluxe Edition Statue will be available January 2016 but it can be pre-ordered now for $379.99 at Entertainment Earth.